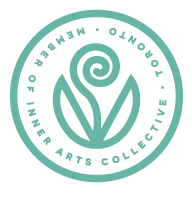 Inner Arts Collective is a community of practitioners dedicated to providing healing arts services to the community, developing themselves professionally, and collaborating with peers. A healing hub for the new millennium, bringing health, energy, and personal development opportunities to each other, our communities and the planet. At Inner Arts Collective we offer membership plans to practitioners seeking healing spaces to meet clients, collaborative work space to network with other practitioners or work on projects, and group spaces to attend or offer classes, workshops, or retreats. Membership plans range from $60-$450/month, based on their needs. Inner Arts Collective is not a typical coworking office space. Membership also includes networking opportunities, the chance to be part of the Danforth BIA, our Rosseau Sanctuary, unlimited access to the main floor lounge to work on personal projects, and opportunities to attend monthly professional Development Workshops. Members are encouraged to book their own professional events or workshops as well, as part of connecting professionally with the collective and increasing awareness about what you do within the community. At Inner Arts Collective, support is reciprocal: The more you put into collaborating and receiving support at the IAC, the more you get out of it. No member is required to participate in any of our events, however the more connections one makes, the more opportunities they have to grow themselves and their practice. At the IAC you can grow your practice, your professional community and your clientele simultaneously, all the while keeping it affordable, co-operative and Fun. Born in August of 2014, Inner Arts Collective was essentially a response created out of a combination of offer and need. Several practitioners, including Sarah, were renting a healing room together from Melanie at the Village Healing Centre. A growing need by other practitioners to rent the space in this model came at the same time that Sarah received lease offer for a larger wellness studio, so Melanie and Sarah decided to collaborate on the creation of a new, larger version of the healing room. The basic outline of the business came easily as it was addressing a gap in practitioners and healers in their need of affordable space, a flexible schedule and a desire to be part of a community while maintaining their independence in their practice. Coworking offered a perfect model. We registered the business, completed our business plan, and moved forward with having a lawyer review the lease offer. The lease was not aligned with our model, but lawyer suggested that despite this initial set back, the idea was solid and needed to be realized. The very next location we looked at ended up being a perfect first location, in the Oddfellows Building at College and Yonge. We moved in over 2 freezing cold January days, and spent the next 10 months growing and fostering an amazing core community. By October that same year, we found out about a series of major construction projects happening on and around our corner. The noise began to escalate, so we decided that in order to support our Members in their practice, we had to move. We knew that community involvement in this relocation would be detrimental to maintaining the momentum that was building within our community. So over the next month, we conducted a community consultation process to learn from our members what their dream location would be. As those results were being synthesized, we found the most perfect home! It was love at first sight. Although it was triple the cost and the space, our meditations with the land and consultations with our community confirmed it to be perfect for being a hub of healing and community. Miraculously, 2 investors came forward to sponsor our relocation, and our landlords offered us a lower lease to begin, with tiered increase over our first 2 years. The dream was becoming a reality! Once the papers were signed for a 10 year lease, we gathered our Members to clear and bless the space and the land, gathered donations and support to renovate and furnish it, and opened doors for January 1st, 2016. We are now located at 257 Danforth Ave, in the heart of Riverdale. Nestled between Broadview and Chester stations. We offer over 60 members a beautiful space and an incredible location to see clients and build community - The neighbourhood is more than we could have ever asked for.